Our 3rd-6th grade students had our first Tefillah (prayer) session on Wednesday. I read a book called I Wonder and explained that our thoughts and relationship with God is complex and changes as we experience different things in life. Each of the students were asked finish the statements: I think that God…, I wonder if God…, and I have learned that God… The responses are impressive! We will have tefillah every other week. It will be a combination of developing spirituality and reciting the prayers. My goal is for the students to be comfortable in a worship service as well as to know why we pray. -Want to have your own conversation with your child about God? Rabbi Danya Ruttenberg gives tips on how to approach this conversation. Click Here. 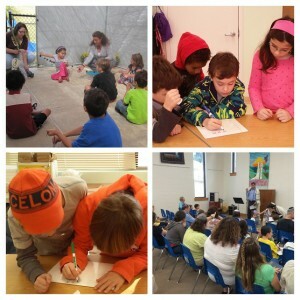 3rd-6th graders also received Hebrew homework this week. Please help them practice, call the Google # sometime prior to Wednesday class, and bring their folders on Wednesdays. When the weather is nice, we like to go out to the playground during a quick class break, please have your child bring or wear closed toed shoes. 3rd-5th grade parents– Mark your calendar for our Machar Youth Group Kickoff on Sunday, October 28th. Come learn about Camp Ramah in New England without leaving your home! Please join us for an online virtual parlor meeting on Wednesday, November 7 at 7pm EST with our Assistant Director, Josh Edelglass. By using our online web conferencing app, you will be able to meet and interact with Josh on your computer screen, see a short presentation about the magic of Camp Ramah, and ask any questions you may have about our program. Join us to hear how Camp Ramah’s rich and varied program offer campers the opportunity to grow, learn, and develop life-long friendships as they connect to Judaism in a unique way. Camp Ramah offers two-week sessions for children currently in grades 2-3 and four or eight-week sessions for children in grades 3-10. We offer a $500 tuition discount to eligible new campers, and significant additional financial aid is available. Please RSVP to joshe@campramahne.org. Explore our website at: www.campramahne.org!